I would teach Hitler how to art and prevent that he would get in power. theprolo is banned for being pure evil, I don't know why but he seems like a pretty evil guy to me. Luke28 should be a moderator since he has glowing eyes that see the truth. Knyne118 is banned for being part cat, cats scratch things. ziberoo should be a moderator since he has no emotions, being a robot and all. Jonjon1234 is banned for not existing, the universe is for existing things not non-existing things. Nedned2k is banned for being a cat, cat's can't use computers. Aritchey is baned for not existing or for designing a building that crumbled to the ground, which ever happened first. EDIT: damn ninja Okamikk is banned for not knowing what he/she is doing. 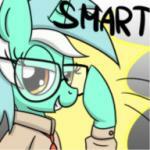 Lyra is my favorite pony and this is my favorite Lyra picture on my computer. You could use one of the unused custom packs you can make. You get the expansion you want but a zergling steals it from you. I wish "Fallout new Vegas" didn't have to end. You're back home but your dogs don't know you anymore and think you're a intruder and eat your face. I wish for a bowl of noodles. People stop impersonating you and start trying to replace you instead. I wish for a hamburger. sorry forgot that I already used that wish. Neptune gets sick and has to see the doctor which will result in the body part you're in is removed and thrown into a incinerator. I wish that canteen would never be empty.